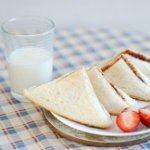 Although PB&J (peanut butter and jelly sandwich) is probably the most popular, there are other varieties of peanut butter sandwich as well. For example, a Fluffernutter (or a Fluffer nutter) is a sandwich made with peanut butter and marshmallow creme. It even has its own holiday, the National Fluffernutter Day, celebrated on October 8. The first Fluffernutter sandwich was made in the early 20th century after the marshmallow creme was invented. Marshmallow creme is a very sweet marshmallow-like spread that was invented by Archibald Query of Massachusetts. The earliest known recipe for the sandwich was published during WW1. The term “Fluffernutter” was coined much later, in the 1960s, to help market the sandwich. To make a Fluffernutter, you need to spread some marshmallow creme on a slice of white bread. Then spread the same amount of peanut butter on another slice of bread. Finally, combine two slices together filling to filling to form a sandwich. Sometimes other ingredients are added. They may be either sweet like bananas or savory and salty like bacon. Wheat bread can substitute for white bread. The term “fluffernutter” is also used to describe other foods featuring marshmallow creme and peanut butter such as cupcakes, cookies, bars, candy, and even French toast.